It's Emani Mone and today I thought I might share a tiny bit of how I keep my hair conditioned and healthy in the winter time. As most woman know this is the season where we want that perfect holiday curl and bun if that's your style. But, it all begins with a good foundation, your hair! Now because I knew how much straightening I was going to be doing this month I went for a #NoHeatNovember which was heavily inspired by no shave November but in a girl friendly kind of way. Doing this as well as conditioning my very curly hair every two days gave so much length as well as thickness. Side note: my hair is curly but as it grows longer it gets thinner :(. 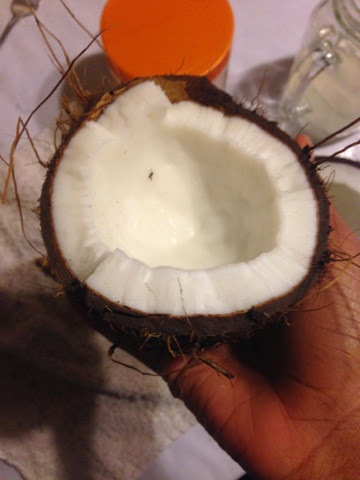 Anyway, after that I discovered my hair loved coconut oil, milk, water pretty anything coconut! lol. So I decided to watch a few YouTube tutorials and learn how to make my own concoction. Coconuts have many healing properties and they actually stimulate hair growth! Maybe that's why without heat I retained length and my hair grew a whole inch last month! Well here's a little bit of my tutorial in words. I started off with two coconuts store bought for $1.50 each. My mason jar to capture the coconut water. My old jar of Shea butter hair lead in conditioner. 1. 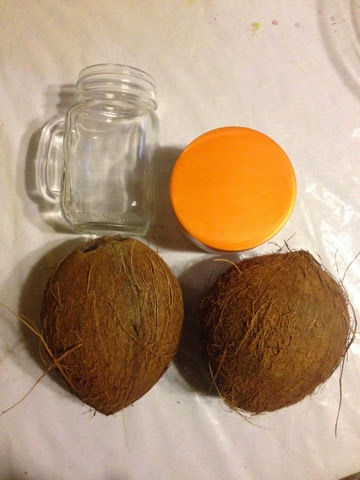 Make sure the coconut eyes are visible and poke holes with a straw or knife and drain all water into the mason jar. 2. After all the coconut water is out of the coconuts find the biggest hammer you can find and crack those babies open. (Make sure you do this not on a glass table like I almost did lol). 3. If you want you can stop here and just use the coconut water as a deep conditioner by putting the water in your hair and leaving it on with a shower cap for about an hour. Or you can keep going and be cool and conditioned. 4. Now that you have the opened coconut you can use a scrapping tool or a fork to get all the coconut meat you can get out. 5. If you have a blender you can easily put all the meat you've gather and purée until it blends into a milky substance, which you can use as a deep condtioner like in step 3. If you don't own a blender you can use a pot with boiling water. Put another glass cup in the boiling water with the meat in the glass cup and stir until all the meat Is in milk form. Any access can be put into the jar and refrigerated!! Or else it will spoil and stink. Hope you ladies and guys try this and let me know how it works!! It really works for me!